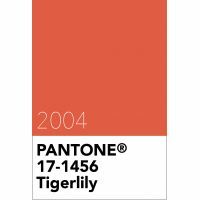 The Pantone Colour of the Year for 2004 is Tigerlily 17-1456. Pantone Tigerlily 17-1456 acknowledges the cool exoticism of orange. Drawing its inspiration from the flowers around us, this warm hue contains both red and yellow to evoke power, passion and rejuvenation. Tigerlily 17-1456 is from the Pantone Fashion, Home + Interiors colour library.